Easy Care sheep have been developed as a low maintenance sheep, producing lambs which are lively at birth and produce a good carcase on a low input system. Shedding wool, doing away with the expense and hassle of shearing is one of their main attractions. Developed from the Wiltshire Horn "hair sheep", crossing with other breeds has resulted in no horns, hardiness, easy lambing, good mothering ability and low veterinary requirements. The breed is Easy Care. We produced our first lamb boxes from our Easy Care Sheep some years ago and plan to sell some this year. In 2019 we are lambing in February and April. We have organic whole or half lamb/hogget/ boxes available to order from July. The abattoir we use is small, local and as stress-free as possible for our animals. We have introduced a Suftex ram this autumn (Suffolk x Texel) for some of the ewes and we will be interested to see the lambs he throws. Our lambs suckle the ewes and graze our organic pastures until they are at least 3 months old. After weaning they graze fresh pasture until they are ready for slaughter. You can order a half or whole lamb box cut up as you request, or if you are a budding DIY butcher, order to cut up yourself. We have organic lamb and hogget for sale now (November). Hogget is last year's lamb, it has a stronger flavour than lamb, but is still tender. Our mutton will be available in the autumn. For more about hogget and mutton see hogget-mutton page. Call and ask about our lamb packs if you can't manage a whole or half lamb. 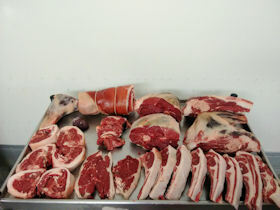 Buy boxes of whole or half lamb or hogget/mutton collected or delivered. Whole lamb for DIY butchering collected from the farm. We can arrange delivery of your meat to you in an insulated box by overnight courier. Half box of mutton shown above. 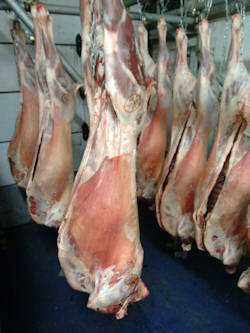 Mutton/Hogget will be approx 12kg/half or 24.5kg whole. Meat from half a lamb will take up a drawer in your freezer if you are thinking about space. Please contact us as soon as possible to reserve your lamb/hogget and tell us how you would like it butchered (cut up), so we can instruct our butcher. 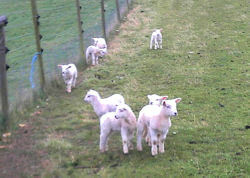 If you don't think you can manage a whole or half lamb, please contact us to ask about our smaller "lamb packs".